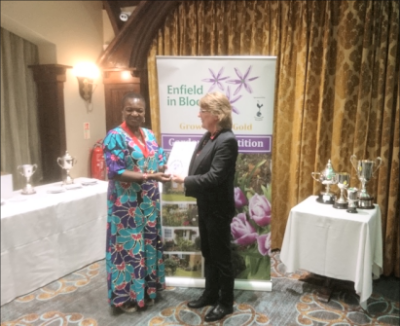 Woodcroft Wildspace is delighted to have been awarded not one but three awards in the 2018 Enfield in Bloom Awards. 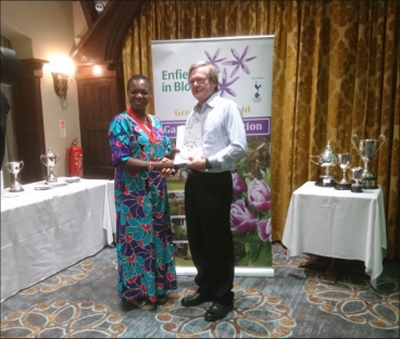 In the “Best Exceptional Horticultural Contribution for the Local Community” category, we won two awards. 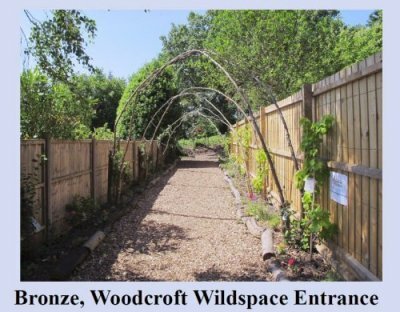 The new entrance in Downes Court won a Bronze with the aid of an award for the plants from Greggs the bakers under their “greener with Greggs” scheme and a huge effort by the volunteers to keep them all watered through the scorching hot summer. Photo: Bob collecting Bronze Certificate. Our Organic Sensory Garden won Silver showing just how valuable our investment in rainwater re-cycling was in the face of the hot dry summer conditions to keep the vegetables growing and the Cadoun (a giant thistle) spicily sensory. A fantastic effort by all the volunteers. Photo: Fiona collecting Silver Certificate. 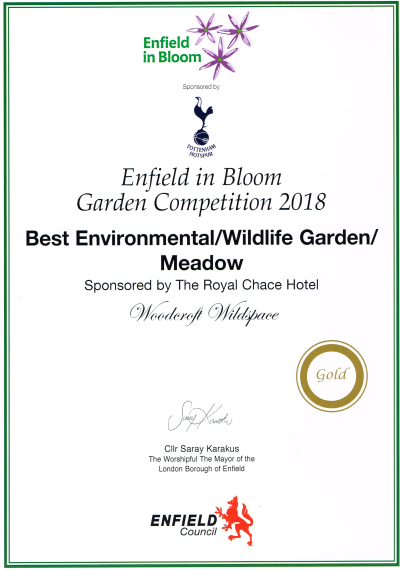 And, for the fifth year in a row, we also won Gold again for the whole site in the “Best Environmental / Wildlife Garden / Meadow” category. 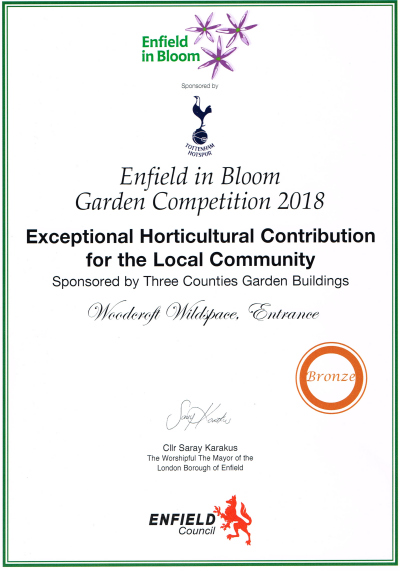 A really superb achievement by all the volunteers, enjoyed by over 1000 school children in the summer term alone as part of their outdoor learning experiences. It clearly made a lasting impression as we had a steady stream of young visitors, throughout the summer holidays, with bewildered and highly impressed parents in tow! 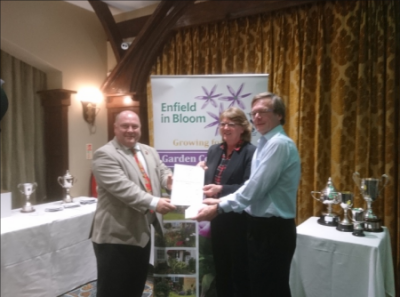 Photo: Bob & Fiona collecting Gold Certificate. 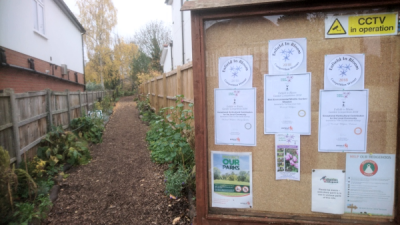 Left - awards proudly displayed on notice board. 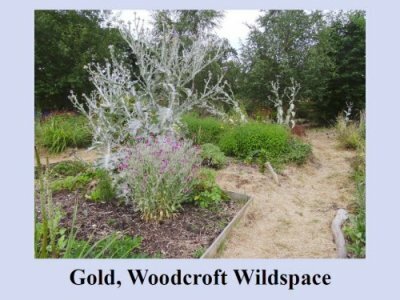 A big thank-you to all the Woodcroft Wildspace volunteers and our visitors or all ages for making it happen – and the EiB committee for their accolades with the awards. Our normal opening times are 9.00 am to 5.30 pm every day in summer. Closing at dusk in winter. (times approximate). 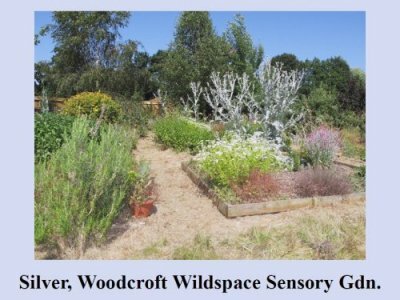 WOODCROFT AND VOLUNTEERING - WHAT'S IT ALL ABOUT?